Archer on Airguns: The Easy Way to Sight-In an Air Rifle Scope and other great videos. The Easy Way to Sight-In an Air Rifle Scope and other great videos. Just published! 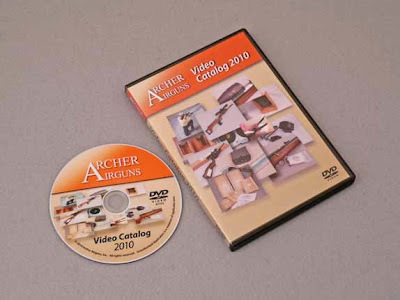 The Archer Airguns Video Catalog 2010 is a new combination DVD containing all the videos we posted on YouTube during 2009. This DVD version allows you to view Stephen Archer's popular airgun videos on your Mac or PC, or play them on your television at home, instead of having to be on-line using the Internet. - Air rifle and product reviews, including the QB78, QB57 and "Silent" Pellet Trap. - Shooting techniques, including easy ways to mount and sight-in an air rifle scope. Also how to master the "artillery hold" that is so important for successfully shooting spring air rifles. - Customizing and increasing the muzzle velocity of your QB78 family air rifle. This DVD is ideal for those without high speed Internet access or for viewing in higher quality than is available on YouTube. You can find it for sale in the Technical Manuals Page of our store. Stop that QB79 barrel contact problem for good!